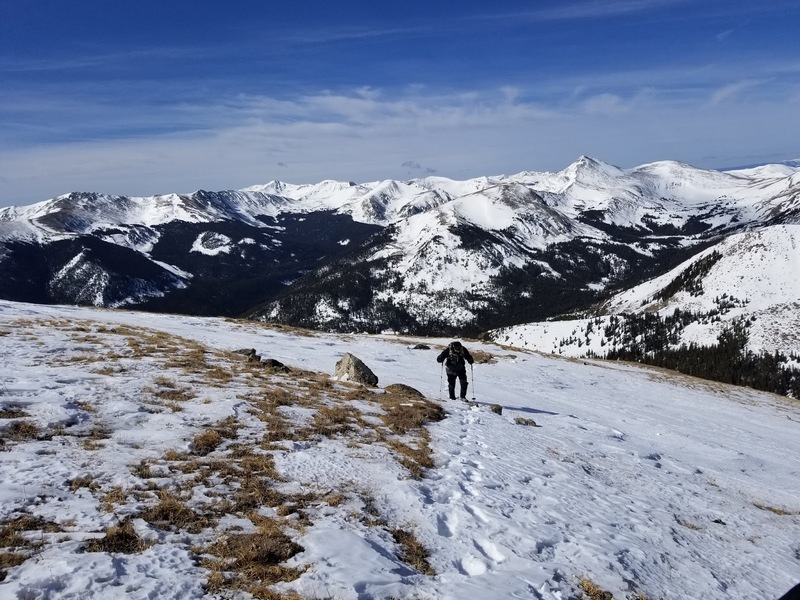 This hike was all about my 13-year old son Luke's first winter* 14er. (* - yes, technically it was April, so not calendar winter, but winter conditions it was). He has grown and matured wonderfully in the last year and several months before our planned trip Ihad the idea that this was the year to let him give this a try. The first step was to see if he would be interested. That's the only way this would work. I brought it up to him and explained how I thought he could do it and how I would prepare him for it, and he was up for the challenge. 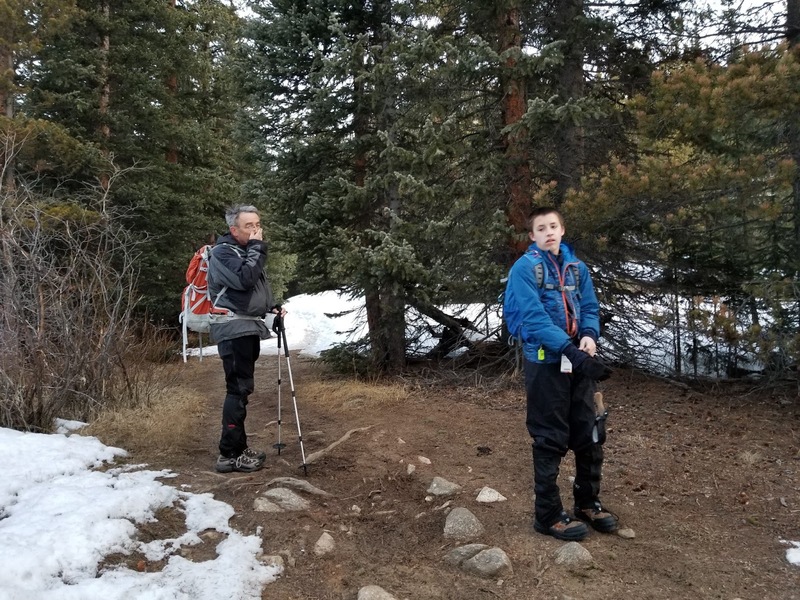 In the months leading up we worked on making sure he had all the proper gear and clothing and this included buying some snow gaiters and microspikes for him. I lent him my Osprey Stratos 24 pack and also passed a pair of my winter boots down to him as they were a bit small for me. For the hike we had him wear a pair of athletic pants and then a pair of wind pants over them. On top he wore a synthetic long sleeve shirt and his light Chicago Bears sweatshirt with his winter coat over it all. He had normal socks on under the winter hiking boots. He did really well clothing wise. 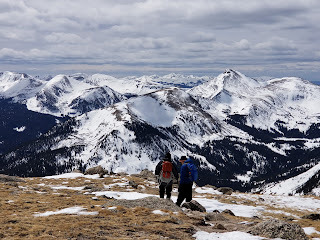 I wore my long underwear (polypro) top, my 14ers synthetic long sleeve and my gore-tex jacket on top. 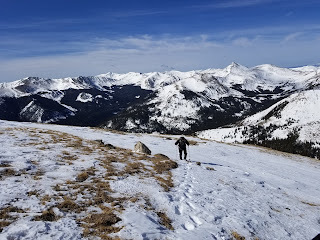 I wore my Mountain Hardwear winter pants on bottom (no long underwear bottom) and I also did fine with that the whole day. In fact on the hike out when we made it into the trees I ditched the long underwear top and had my jacket fully unzipped. For the hike food-wise we targeted each bringin several GU gels along, several granola-bars and a bit more. Luke brought some fish crackers and teddy grahams. Dad brought several packages of cheese and crackers. I ate my Nature Valley sweet-n-salty bars. I probably had 1200 calories along and ate all of it. I probably could have, should have, eaten another 300-400 at least. We were up at 4:45am to get ready for the hike. I had a few donut holes, a banana, and a CLIF bar for a quick breakfast. We were out the door at 5:20a for a quick drive up the Cottonwood Pass road to the Denny Creek Trailhead. We made it there, put on packs, got ready trekking poles and turned on our headlamps. It was 5:58am when we hit the trail. It was in the low 30s for the start which was a pretty great temperature. When we worked up the initial switchbacks we quickly got warm and did what we could to avoid breaking into sweat. 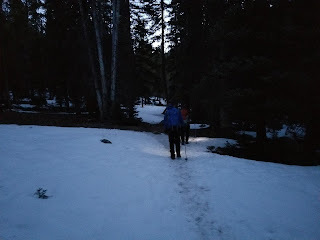 The headlamps only stayed on for about 20 minutes when morning light found us. 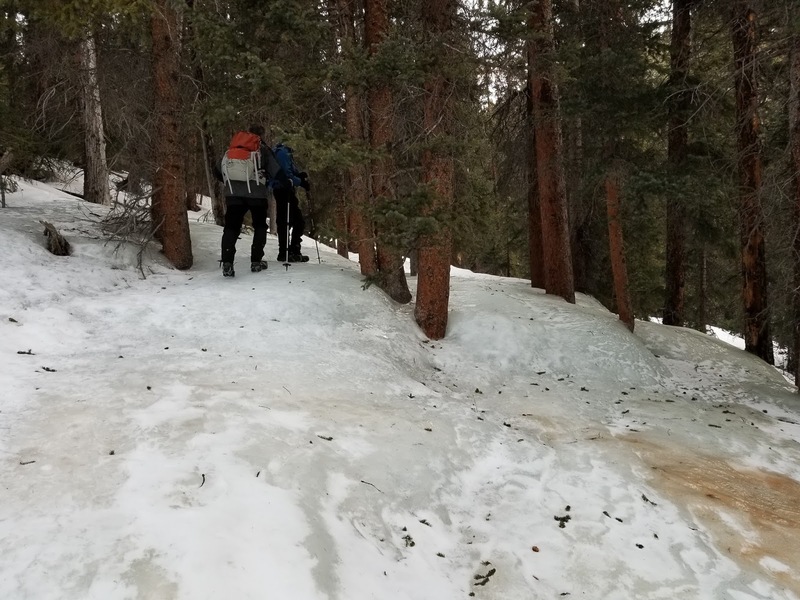 As we continued we went through several sections of snow, some with a bit of slope that we considered the microspikes, but we didn't put them on yet. It wasn't until, oddly enough, we encountered a severe area of ice, the very same one in the very same spot as 2015, that we put them on. This area was much worse than 2015 with a wider spread area covered with ice, it was quite a sight to behold. I helped Luke with his spikes as their rubber was quite firm still being brand new. With spikes on we walked across the hardened ice with ease. It wasn't long after putting on the spikes that we made it to the meadow and not surprisingly we saw a break in the tracks in the snow. It was 7:52am when we hit the meadow. The most obvious went to the right and almost directly towards the hill ascent. We saw much fainter tracks to the left. We began to follow the path to the right but it was quickly moving away from the standard route track and straight up the slope. We grew uncomfortable with this and backtracked. 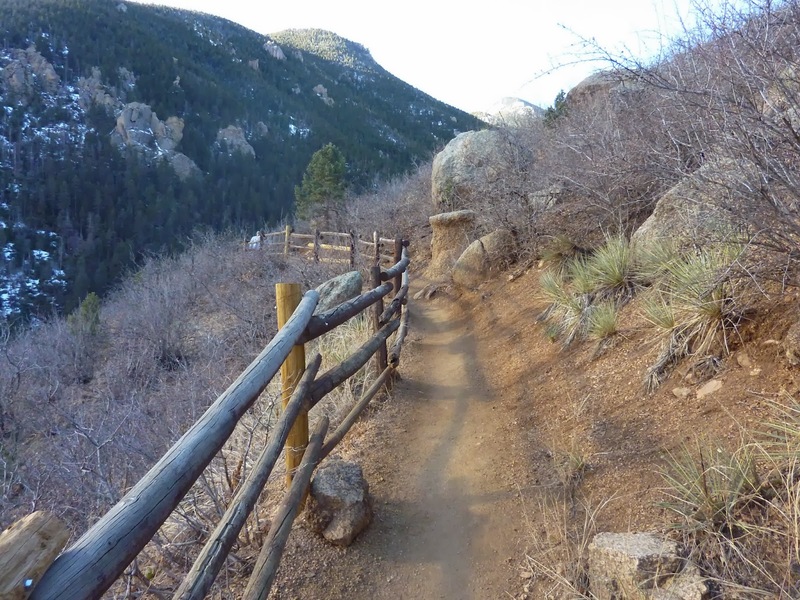 We weren't sure if this had been an ascent or descent route or both. 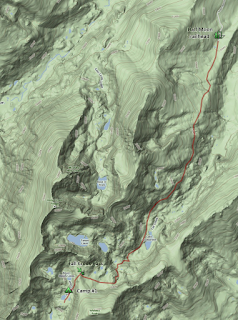 It would make for some steep bushwhacking if it went straight up that slope, though it would shave a ton of distance. Back at the "junction" we followed the faint tracks through the meadow and thankfully the snow crust was firm enough we didn't fall through. This brought us to the switchbacks where it appeared the first switchback had been skipped with a track that went straight up the slope. We followed this til we gained the next switchback. 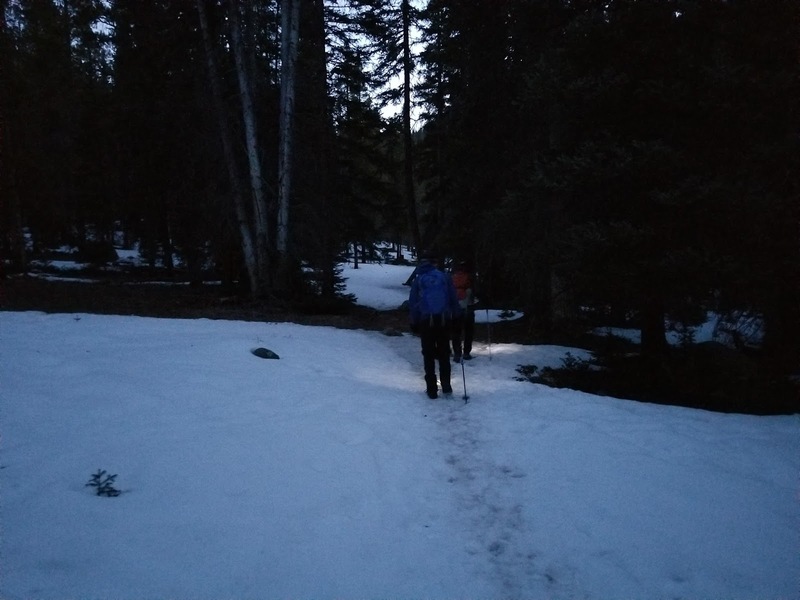 We followed it through another switchback and then hit another "junction", similar to 2015, where the beaten path left the standard route to make a beeline to treeline. We followed this, and again, thankfully the snow remained crusty on top. It followed a similar though not identical route as it had in 2015. This one veered slightly further north than last time. 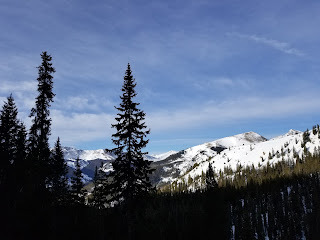 It followed a crest in the slope and put us into treeline at a higher position than last time. We thought this went well. We left the trees up a short slope to a shelf in the slope. We followed this to a gully which we tried to ascend to another shelf but it started us into postholing. It got so bad so fast we ended up crawling up a portion of it to avoid falling in on the ascent. We gained another shelf and this proved more firm and allowed us to traverse off the slope and on to a saddle where the sun was finally hitting. We would deem it the "Sunny Saddle" due to it being the first area, and it was a small saddle, in sunhit that day. At the Sunny Saddle we encountered our first heavy wind and so we donned our balaclavas and heavier gloves. 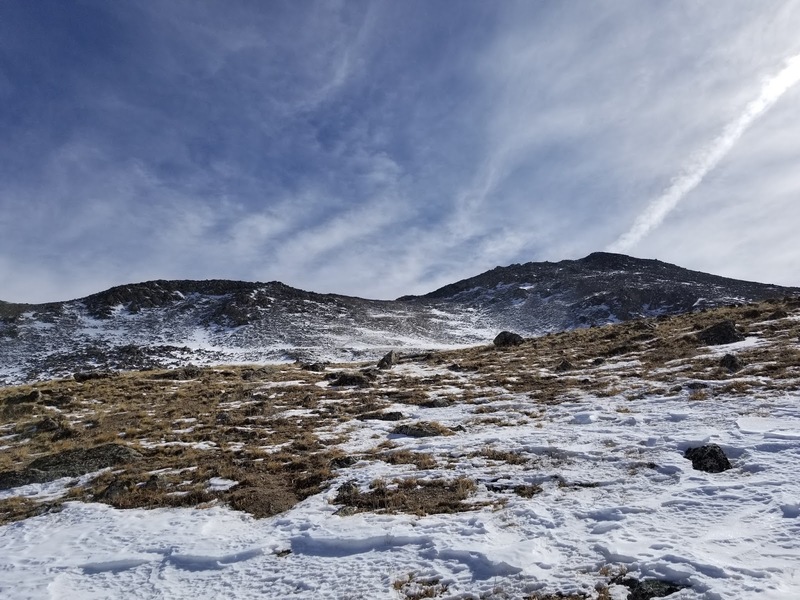 From the Sunny Saddle we ascended on a grassy slope upwards as it looked the easiest of ascent routes from our location, then gradually made a beeline towards where the standard route trail was located. 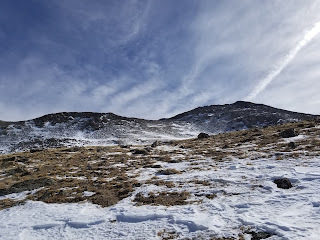 It was fairly easy to follow even as it was sometimes filled in with snow. A keen eye kept us going until we lost it briefly in a rock patch around 12,650. We found it again and proceeded onward always looking for the path through patches of snow. We lost it again briefly around a mound at 13,050. 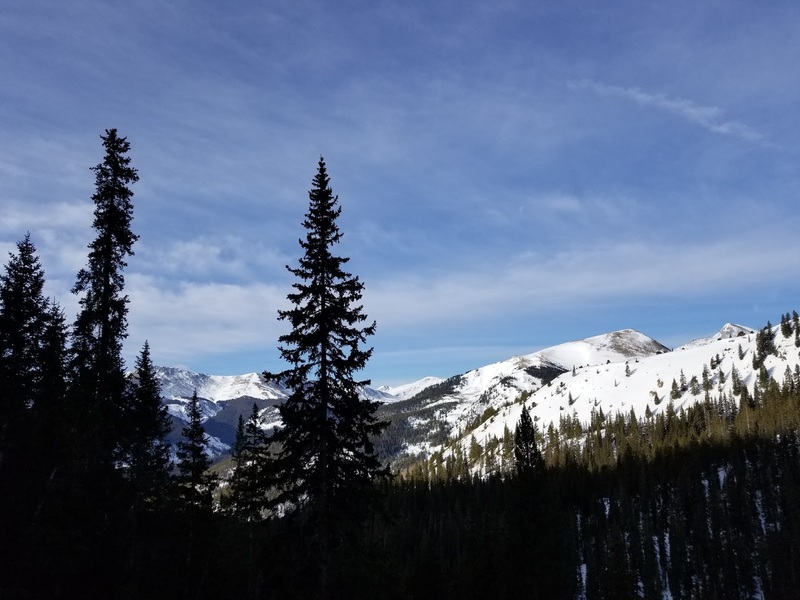 Near 13,200 things were very snow-filled but we could see the start of the switchback series ascending the southwest slope. We beelined for the first point we could see a switchback and found this nearly had us on the standard route. The switchbacks were at times filled in with swow but fairly easy to follow and very helpful as a route. The wind increased as we ascended and finally at the summit ridge saddle at 13,950 the wind was howling heavily. As we began our way on the summit ridge folowing the basic cairns the wind kept us at full attention not to be blown over or off balance. The route-finding was mostly easy with a careful eye. 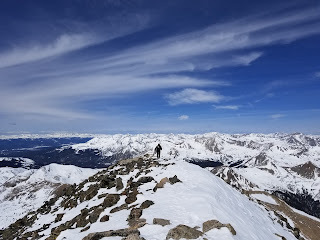 We plodded on carefully through the rock and finally made the cold and somewhat windy summit at 12:10pm. A 6:12 ascent. It was slower than our 2015 ascent but I believe this is somewhat due to us intentionally taking a slower pace. It didn't feel for a second Luke had held us up at any point as he moved strongly. We'll never know if he could have handled a stronger pace, but I suspect given how he performed he could have. The winds weren't quite as bad on the summit as they had been at the saddle. I took a number of photos and was able to make contact with Sarah and let her know the good knews. 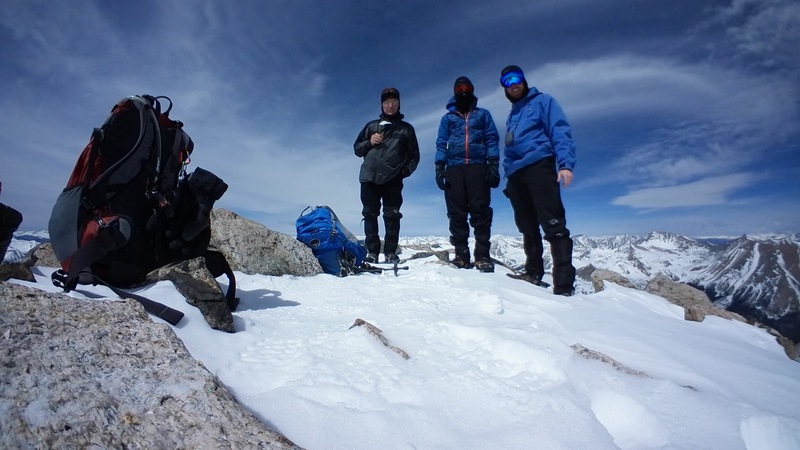 We used my Gear 360 camera to take a group summit photo. We also poured in some snacks before our fingers got too cold. We spent about 25 minutes on the summit. Descending the summit ridge went fairly easily, except for Dad with his older knees. Luke and I began the descent process of meandering ahead and made it to the saddle while waiting for Dad to carefully, and safely make his way to catch us. The descent went very smoothly in the upper stretches of the mountain until we reached the spot where we were prepared to leave the standard route and descend the grassy slopes to the "Sunny Saddle". I had this idea we could follow the standard route further down and avoid trampling the tundra on the grassy slope. 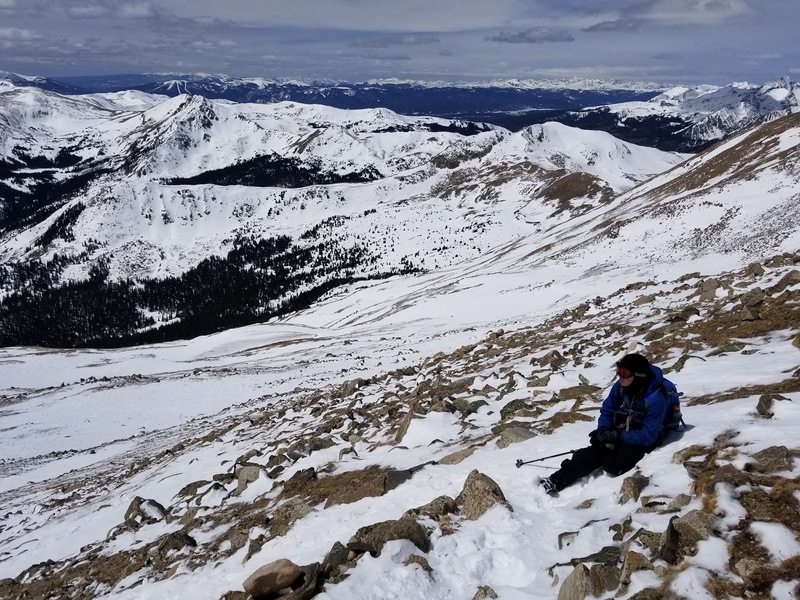 I understood there to be a more flat snowy route to regain that saddle. We started into this alternate idea of mine but quickly found that the standard route was leading us further from the saddle than we wanted. 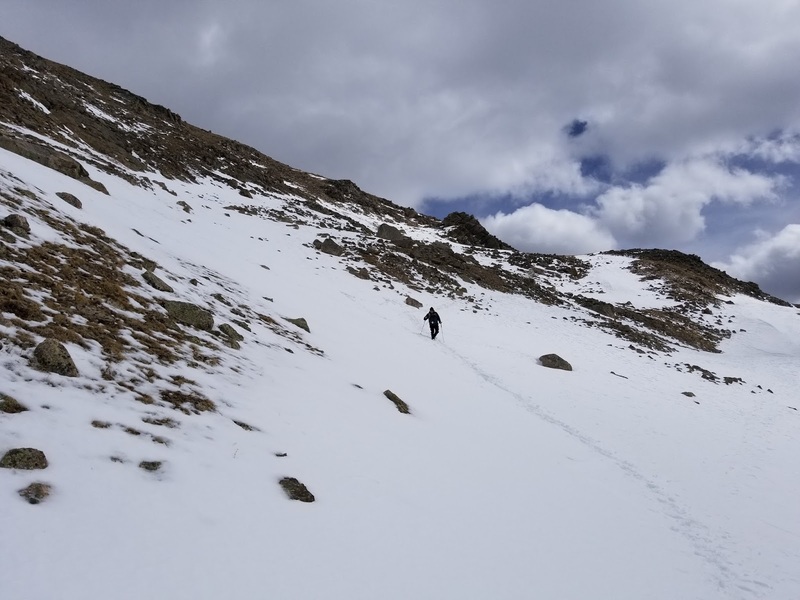 We still ended up cutting across a bit of a grassy slope until we encountered a snow patch leading down a gully. At the bottom of this short gully was flat snow and an easy walk to the saddle. We decided to glissade it and had a nice 50 foot run or so. Back at the Sunny Saddle we scouted out our remaining route back to the trees and here again we began to have postholing issues. In fact this would be the beginning of posthole hell until we had left the meadow on lower down. We couldn't go more than ten steps or so without a nearly waist deep posthole. The temps must have been in the 40s and the surface had really softened up, much worse than we had expected. We were sure at first this wouldn't have been as bad as 2015 but we were wrong. The only plus we had is we didn't as much have to route-find a path as we had done in 2015, we just had to make our way forward in the tracks and suffer the challenge of sinking in every few steps. When we reached the standard route again we hoped it would be a bit more consolidated but this didn't hold true yet, and we still postholed. 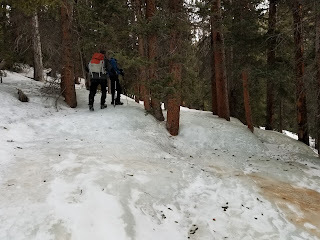 When we descended a bit lower into the switchbacks where we had followed a shortcut here the postholing ended for a bit, but was replaced with muddy trail and slushy snow alongside it. We followed the switchbacks down to the meadow where the postholing was as bad as ever. Saving grace was that after the meadow the postholing finally did stop as the trail compacting was strong enough. We kept the microspikes on until we had made it through the "ice river" and then took them off. The slushy snow after that had a few slick spots when the trail gained slightly in grade but we made it fine. All that remained was the "death march" back out to the trailhead. We had flurries and slightly dropped temps on us for the last 30-40 minutes of the hike out. It was 5:29p when we made the car which made for a 4:54 descent.